This attractive, durable, and affordable Equus 7000 Classic 2 in. electrical temperature gauge features elegant styling, 90 degree sweep, black dial, chrome bezel, and backlit illumination for efficiently monitoring engine coolant / water temperature. Installation hardware included. Additional adapters sold separately. Back-Lit™ illumination for night use. Includes red and green bulb covers. Includes 1/8 NPT sensor, 1/2 NPT, 3/8 NPT, and M16x1.5 adapter bushings. This attractive, durable and affordable line features a selection of elegantly designed 2” stainless / chrome bezel gauges with 90º (electrical) and 270º (mechanical) sweeps, as well as matching tachometers for the automotive aftermarket buyer. The series' increased performance and accuracy is achieved by its original equipment-type Electric Aircore meter movement or solid brass mechanical Bourdon Tube meter movement. All feature Back-Lit™ illumination and include easy-to-read mounting instructions in English, French and Spanish. The series' increased performance and accuracy is achieved by its original equipment-type Electric Aircore meter movement or solid brass mechanical Bourdon Tube meter movement. All feature Back-Lit™ illumination and include easy-to-read mounting instructions in English, French and Spanish. 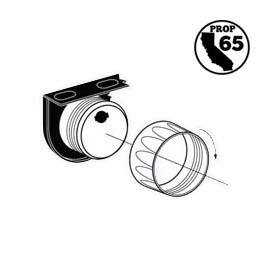 All of our single and triple gauge kits include a rear ring mount attachment to make installation very simple. What type of wire is recommend for the installation? We recommend to use 18-20 AWG stranded copper wire. What would cause my gauge to peg past 280? A bad ground connection can cause a gauge to peg. We recommend to verify that there is a good clean ground. You can attempt to ground the gauge directly to the negative side of the battery to determine if the ground is faulty. If you use Teflon tape on the sender then you may also require an additional ground from the sender to the chassis. Can I use a different sender than the one included with the gauge? Our gauges are designed to work with the sending unit that is included in the packaging. Other sending units may have different specifications and are not guaranteed to work.